Patient Karen Cowie wearing the new specialist kit, with Sonya Bainbridge and Rachel Warth from Kendal Lymphology. Here at St John’s we don’t just care for people at the end of their life, we play an active part in the community helping people with a wide range of conditions, and at all stages. We work in partnership with many other organisations, sharing best practice, and doing all we can to improve access to care in our community, when people need it most. Many people don’t realise that our care extends across the North Lancs and South Lakes area to a population of around 250,000 people. 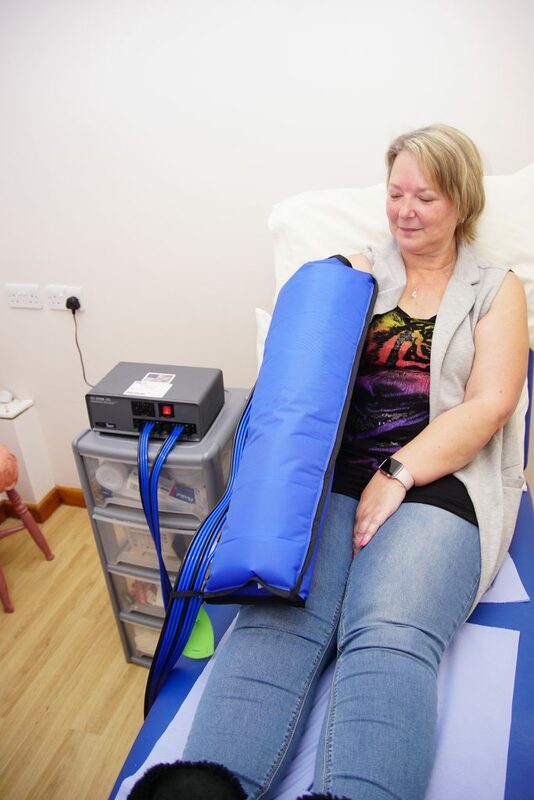 A good example of the kind of work we are involved in, that maybe you wouldn’t expect, is our partnership with the Kendal Lymphology Centre, helping provide a local clinic for Lymphoedema patients. Lymphoedema is a distressing and limiting condition that people suffer from for a number of reasons, but they can be especially at risk after the removal of lymph nodes. One patient, Karen Cowie, has been coming to the clinic here at St John’s for about a year, after having surgery for breast cancer. She has been coming to see Rachel Warth and Sonya Bainbridge from the Kendal Lymphology Centre, for advice on self-management and to be measured for compression hosiery. If you would like to know more about St John’s Hospice or the Kendal Lymphology Centre, visit their websites at www.sjhospice.org.uk and www.kendal-lymphology.org.uk respectively.